Beanie Weenies. Not the most glamourous of meals by any stretch of the imagination. It's one of those kitchy old dishes that grandmother's always loved to serve to their grandchildren. Or at least mine did. Often - when we spent the night and felt oddly grown-up sleeping in the dusty room which we knew was haunted, under the covers in the creaky old iron bed - there were beanie weenies for dinner. Am I the only one with memories like this? I don't know why I was craving them last week. I haven't had them in ages. Except that I was going through an old box of black and white photos and came across a portrait of my very young grandmother. The same portrait that hung in that room, just above that old bed. 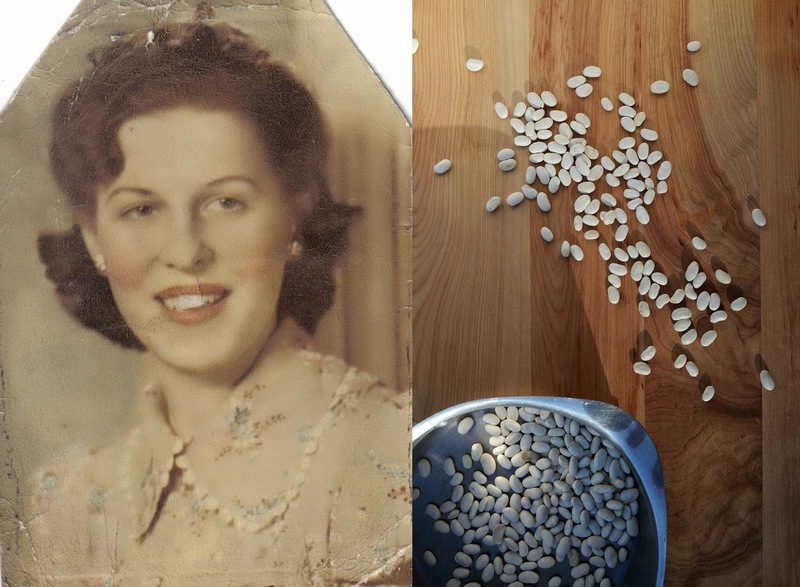 Being the foodie that she was, I'm pretty sure my grandmother's beanie weenies never saw the inside of a can, but hard as I try, I haven't been able to recreate her recipe. I just can't get it right. So I came up with my own. With souped-up ingredients like caramelized onion, spicy jalapeno, smokey molasses, pepper bacon, and uncured beef hotdogs. It's something that the foodie in me can appreciate just as much as my children appreciate the sticky, sweet and smokey flavor. 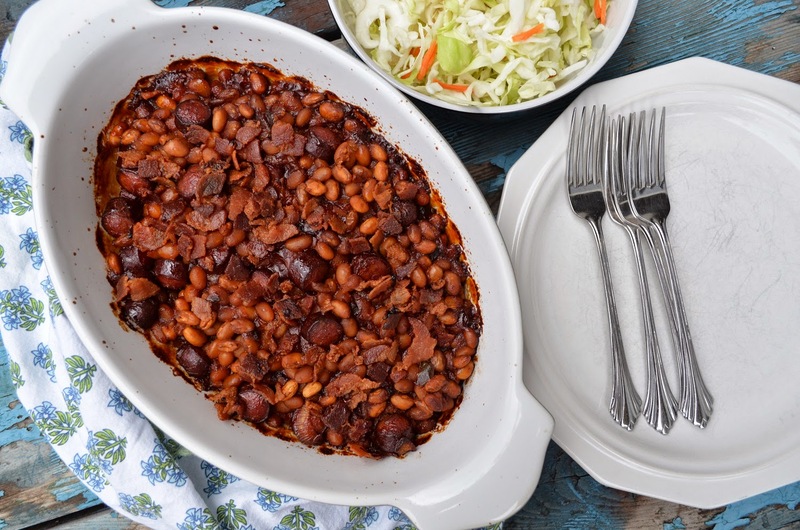 It's like a sophisticated cross between Boston baked beans and beanie weenies. Here's my pimped-out version. 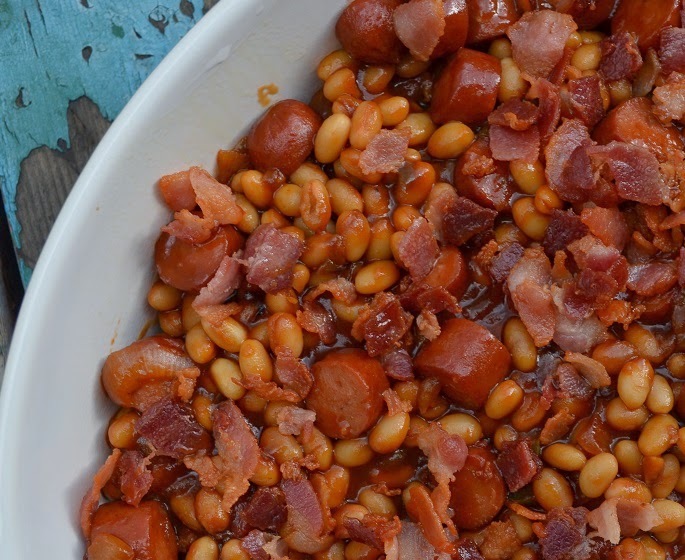 These are definitely not your grandmother's beanie weenies. Preheat your oven to 350 F (175 C) and grease a 2-quart casserole dish. In a large skillet cook the bacon until it's just barely crisp. Remove from pan and set aside to drain on paper towels. Drain all but about a tablespoon of bacon fat from the pan. Add the onion and a pinch of salt and turn the heat to medium-low. Cook the onions, stirring occasionally for about 20 minutes, until they are a rich, golden colour. Add the garlic and jalapeno and cook for 5 minutes longer. Mix together the ketchup, water, brown sugar, molasses, mustard, and Worcestershire sauce and pour over the onions. Stir in the beans and bring to a simmer. Add the hotdogs and salt and pepper to taste. 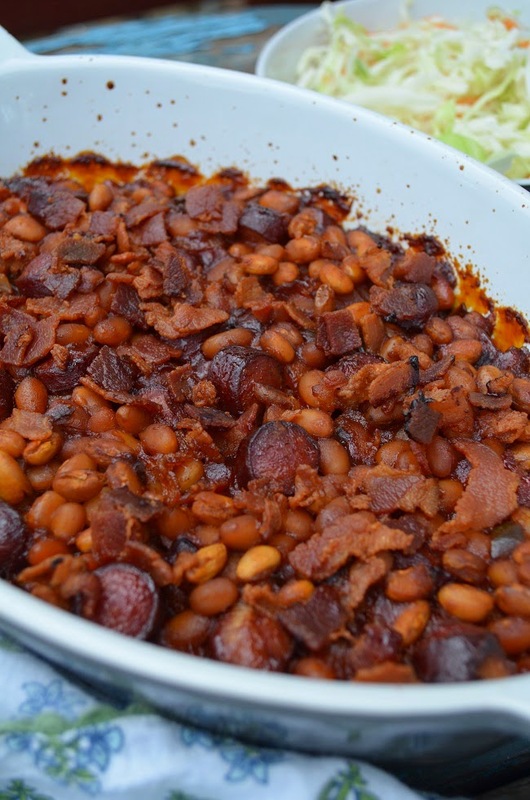 Pour the beans into the prepared dish and scatter the bacon on top. Bake for 1 hour. Follow along on Instagram, Facebook, Twitter, and Pinterest!